Uncommon Good (UG) is a Claremont-based non-profit organization that believes that every child, regardless of ethnicity or socio-economic status should have access to a meaningful college education. To bring that vision into reality, the UG’s Connect 2 College Program matches students from 4 th-12 th grade from the Pomona Valley area with mentors who help them envision themselves in college, tutors to help them stay on track, and college access programming to prepare them for college/university. 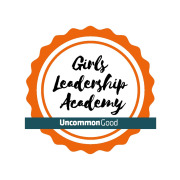 Uncommon Good’s Girls’ Leadership Academy (GLA) provides students in middle school (6 th & 7 th grade) a space to have honest and brave conversations about the their lives, community, and world. As a leadership and support group, students participating in GLA workshops develop their critical thinking, establish healthy relationships and embrace challenges. Together we harness and foment the skills, knowledge and opportunities needed for young women to maximize their authentic potential in their home, school and community. Work closely and attend regular meetings with the GLA Advisor to plan, prepare and execute GLA workshops and related activities/events. Co-facilitate bi-monthly GLA workshops for 6 th-7 th grade Uncommon Good students. Mentor, track students’ progress and develop strategies to address any areas for further support.